You probably love planning spring outdoor activities for your preschooler just as much as we do. Once the blossoms start appearing on trees and bulbs poke from the ground, we all know it is time to plan for some springtime activities. 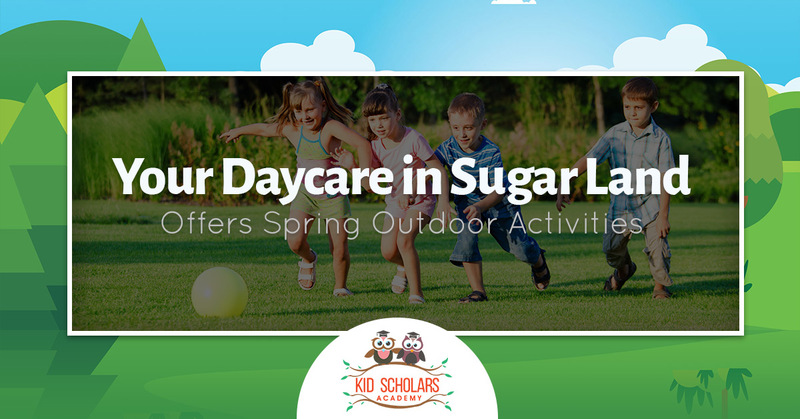 Kid Scholars Academy, everything but your typical daycare in Sugar Land, will help your child explore the new season. We hope you have plenty of spring activities that your child will enjoy. If you need help, here are a few ideas. Use bubble wands of different shapes and sizes to create awesome bubbles for your children to blow, chase and catch. If you don’t want to buy bubbles from the store, there are plenty of recipes to make your own bubble mixture. You can even buy bubbles that can be caught and handled by the kids. Create a simple obstacle course that your child can have fun completing. Even if you don’t have the materials to build an obstacle course, you can throw in a few sections where you have your child skip or jump. This will give your child plenty of exercise and keep them laughing and amused for hours. Flying a kite may very well be the ultimate carefree pastime. Kite flying is much more than just sheer fun, there are plenty of good reasons to take up this activity. Kite flying is an outdoor activity framed by the great expanse of sky. Soaking up the sun while running around with a kite is beneficial to your child’s health. The idea that wind does all of the work is a myth, your child will have to run to get that lite up in the air. A colorful kite gracefully soaring across a blue sky is a work of art. Even if the kite was bought at a store and not made, it still gives your child a personal expression and celebration of beauty. You would be hard-pressed finding someone who doesn’t like jumping in a puddle. After the next spring rain, have your child put on their rain gear and rubber boots and go outside and jump in some puddles. A bath and snacks will follow this messy adventure. Go on a bug hunt with your child and see how many different types of insects you two can find. All you need to do is turn over a few rocks or pieces of wood and you will find many. Do you need a good reason to take your toddler on a picnic? We have several good reasons. A picnic is a quick escape from the ordinary. It has probably been quite a while since you have had lunch anywhere but at your dining room table. Spring offers the perfect opportunity to get outside and eat under the sun. While you are your child are enjoying your picnic lunch, it is the perfect opportunity for you two to listen to birds sing, watch the bees buzzing around and feel the cool breeze on your faces. This is the chance to appreciate the wonders of nature. Best of all, going on a picnic is an inexpensive activity that you can do every week. Make a list of things you want your child to find and set off on a treasure hunt adventure. You can have them search for rocks, bugs, flowers and other things you might find at the park or on a nature trail or you can buy things to hide in your yard like pencils, coins and a small treat. Use sidewalk chalk and your driveway and have your child create works of art. Sidewalk chalk is larger than regular chalk and easier for your child to handle. Let them make the biggest possible mess because cleanup is as easy as washing it away with a hose or waiting until it rains. Your child will love going out in the backyard and playing a few games of hide-and-seek. Take your time finding them and they will be absolutely delighted that they have outsmarted you. Take your toddler to the local pet farm to have them meet the adorable baby animals. If you two are lucky, you might get the opportunity to feed them. Washing the car is a wet and messy chore that your child will love to do. Water down your car and have your child suds it all up, they will want to scrub for as long as they can. They will be exhausted when the task is complete. Squirt guns filled with paint, need we say more? Just like you, we want your child to excel in every possible way. 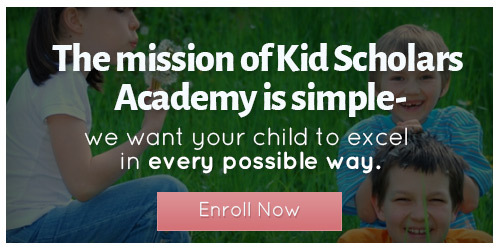 Contact Kid Scholars Academy today.